If you are looking for the 3 Girl JAM post, please click here! 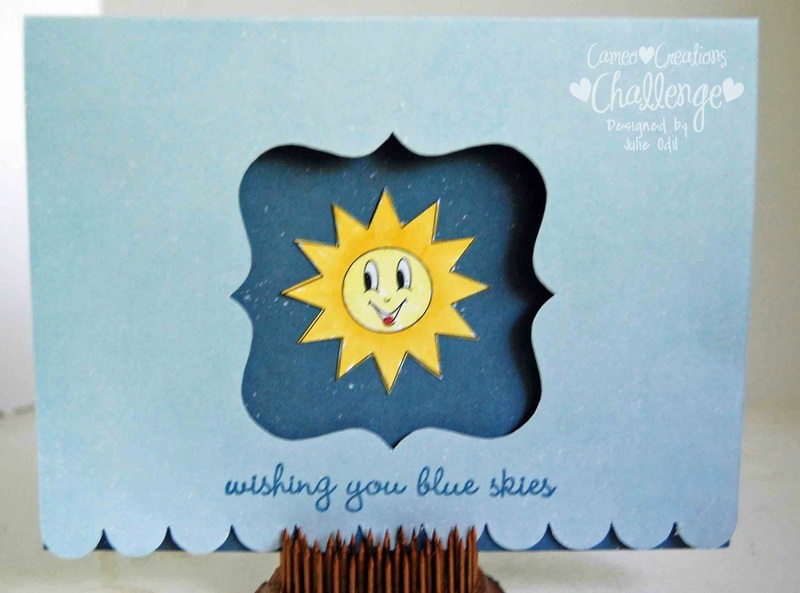 It's time for another challenge on the Cameo Creations Challenge blog. This time, it's a 2 shades of blue challenge. Since I love blue, it was a perfect challenge for me! I used a piece of Echo Park Wintertime double sided cardstock for my 2 shades of blue. The card is a file from the Silhouette store. The sun is a digi stamp from Get Inky stamps that I colored with Copic markers. The sentiment is from the Joy's Life stamp set, "Pun in the Sun". That's it for me, I'd love to see your two shades of blue project! Such a cheerful desing. Love the fancy square window. Sweet, happy card! I love blue, too!! Tres cute! Love the sun peeking out---sort of like the weather here! This is wonderful. Love how your sun is in the center. He is a Get Inky cutie for sure. TFS.